Audi is unveiling a themed vehicle of a special kind at the Detroit Auto Show – the Audi Q3 Vail with an output of 231 kW (314 hp). The compact SUV, which is named after the famous winter sports venue in the United States, unites a powerful presence with a sporty lifestyle. The Q3 Vail is a highlight of the young model series that only launched in 2011. Audi is unveiling a themed vehicle of a special kind at the North American International Auto Show in Detroit – the Audi Q3 Vail with an output of 231 kW (314 hp). The compact SUV, which is named after the famous winter sports venue in the United States, unites a powerful presence with a sporty lifestyle. The Q3 Vail is a highlight of the young model series that only launched in 2011. 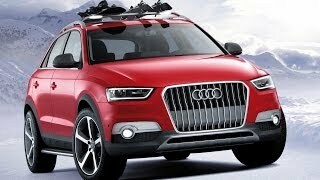 The Audi Q3 Vail represents a new, potential variation on the SUV concept. The themed vehicle has been designed for young fans of winter sports who love skiing or snowboarding. 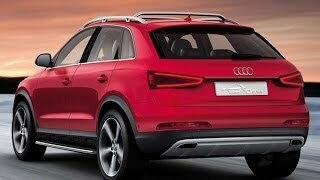 The Audi Q3 Vail is a sporty and robust compact SUV offering many practical attributes, an elegant appearance and individual design highlights. The themed vehicle is painted in the color developed specially for it – Energy Red. The red paint contains golden pearlescent particles. The add-on body parts are in matt gray quartz-based paint, and underline the vehicle’s robust and rugged appearance. The high-gloss package, a characteristic feature of the model line, enhances the area around the windows with eye-catching elements in aluminum and high-gloss black. Vertical struts made from aluminum are integrated in the single-frame grille. They extend across the full height of the grille. In the area of the horizontal panel, which carries the license plate on series-built vehicles, they are pulled outwards to striking effect. The struts exhibit the bicolor theme that the Audi designers developed for the Q3 Vail: their lateral edges are painted in matt quartz-based paint, and the slim front faces have a high-gloss finish. In the headlights the zones in the lower area of the light-guide elements, which generate the daytime running lights, are painted anthracite. The side air inlets further emphasize the themed vehicle’s powerful appearance; their top areas are covered by solid aluminum panels. The underbody guard beneath the front end is also made from aluminum. Eyecatching features on the sides of the Q3Vail are the flared wheel arches and running boards, which Audi is to incorporate into the extensive range of Q3 accessories. The restyled aluminum roof rails are specially designed for transporting skis and snowboards – these two items of sports equipment are made from carbon fiber. The front roof-rail support integrates compact, energy-efficient, wide-angled LED lights that illuminate the area around the Audi Q3 Vail. They are controlled via buttons in the roof module. The Audi Q3 Vail is fitted with five-arm wheels in 8.5 J x 20 format. Mirroring the single-frame grille, their visible edges have a high-gloss finish, while the inside areas feature the same matt quartz-based paint. The off-road tires are size 255/45. Track width has increased 40 millimeters (1.57 inches) at the front and rear compared to series-built models, and the body is 30 millimeters (1.18 inches) higher. The themed vehicle also features unique solutions at the back – the two tailpipes of the dual-branch exhaust system are integrated in the diffuser and underbody guard area. In the interior of the Audi Q3 Vail, three colors offer an ambience of sophistication and sporty elegance – black, gray and red. The headlining is made from titanium gray Alcantara; large parts of the interior, including the carpet, are black. The black, ribbed floor mats are edged with narrow strips of red velvet-finish leather. An innovative leather/fabric material is used for the upholstery – thin strips of leather just a few tenths of a millimeter wide, are interwoven with yarn. The upholstery features piping with double seams; like the contrasting stitching, the piping is red. Small sections of the upholstery are made from red velvet-finish leather – a hardwearing material that looks similar to nubuck leather at first glance, but in fact has a finer structure. The segments integrated in the door trims are also in red velvet-finish leather, trimmed in steel gray Fine Nappa leather. The entire instrument panel in the themed vehicle is trimmed in black Fine Nappa leather. Contrasting stitching in titanium gray is an elegant highlight. The leather across the hood of the instrument cluster is steel gray with red contrasting stitching. This color scheme is replicated on the door armrests at the front and rear. The front section of the center tunnel also has a leather trim. The inlays around the S tronic selector level, at the front of the cockpit and in the doors comprise a three-dimensional stainless steel mesh that requires a complex manufacturing process. The selector lever features a high-gloss black ring and an aluminum badge with a milled “Q3Vail” signature. The lever gaiter is enhanced by red stitching. Aluminum takes center stage in the instrument cluster. The most striking elements are the metal dials around the speedometer and rev counter. They were made using a rotary-grinding process. Metal is also used on their rings and around the edges of the control lights. Horizontal bars and small fins give the dials and needle centers a sporty, three-dimensional look. The leather steering wheel features red contrasting stitching and an aluminum trim. Behind it are two large shift paddles for manually controlling the seven-speed S tronic. The footrest and the pedals have thin pads made from rubber. Slits offer a glimpse of the stainless steel beneath the pads. In some parts of the interior the trims are in high-gloss black – the display and control elements on top of them appear to float. This applies to the area surrounding the driver information system, the zone around the air vents, the periphery of the MMI terminal and the row of switches on the center console. Aluminum inserts give the black switches an air of sophistication. Chrome trims adorn the controls of the air conditioning system; the air vents have black ribs and chrome-trimmed rotary knobs. The soft keys for the MMI navigation plus system are made from aluminum, while the control terminal benefits visually from narrow strips of the same material. The monitor, which can be folded out manually, has a trim that matches the surface of the instrument panel. The system includes an animation showing the longitudinal and latitudinal tilt angle of the AudiQ3Vail. In regions that are not included in the map data, the MMI navigation plus system logs the GPS coordinates of the route – for assistance during the return journey. 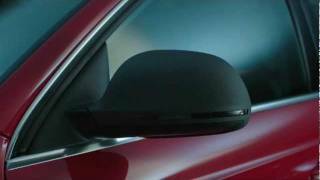 The interior of the Audi Q3 Vail includes two practical devices for winter sports fans. The side wall of the trunk houses a charging station. It can be used for storing flashlights and charging them inductively at the same time. The same technology is used for the Thermos bottle. It is located in the cup holder between the front seats and is able to chill or warm drinks. Both devices have LEDs that show the current charge level. One attractive extra is that, in addition to LED lighting, the flashlights incorporate an infra-red heating element that can be used for warming your hands or a pair of ski boots. Another intelligent solution in the themed vehicle is the trunk mat, which has integrated heated seat cushions. The mat can be folded out and laid over the loading lip. This protects the trunk edge while the vehicle is being loaded or unloaded, and also provides a warm area to sit on when putting on or taking off your ski boots. Small LED spotlights on the inside of the tailgate provide light. The Audi Q3 Vail features a 2.5-liter five-cylinder TFSI engine with direct injection and turbocharging that generates an output of 231kW (314 hp) and 400 Nm (295.02 lb-ft) of torque from a displacement of 2,480 cc. The engine’s five cylinders are consecutively numbered; red wrinkled-finish paint has been applied to the cylinder head cover. A panel made from carbon-fiber-reinforced polymer (CFRP) partially covers the engine, and the air filter is also protected against dirt. There is a decorative trim made from plastic around the engine compartment. The acoustic mat on the inside of the engine hood has a “Q3 Vail” logo embroidered in dark gray. The power of the turbocharged five-cylinder unit is transferred to the quattro permanent all-wheel drive system via a seven-speed S tronic transmission. 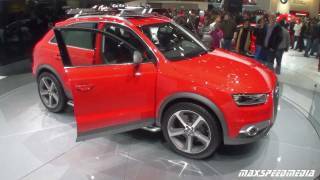 The Audi Q3 Vail accelerates from zero to 100 km/h (62.14 mph) in 5.5 seconds and continues to a top speed of 262 km/h (162.80 mph).